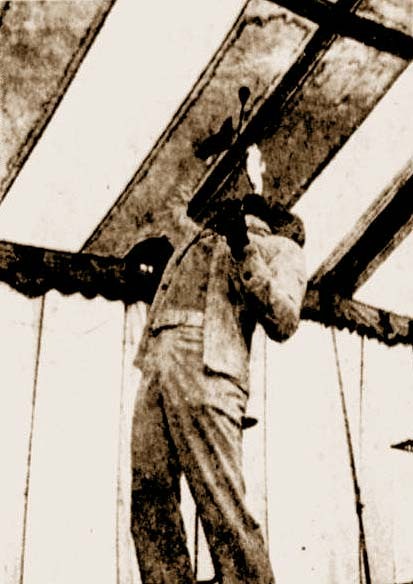 PRESQUE ISLE - Jack Waller strolled casually off the four foot platform stage, half-acknowledging the crowd of county folk who had purchased tickets to his sideshow. The silver-haired Oklahoman had just finished his 15-minute act in which he had displayed a tattooed dog, eaten fire and performed a feat of magic. It was a series of events that Waller had become comfortable with and through the constant repetition of performance, his well timed movements had acquired a sense of mechanization. As the Northern Maine fair jerked to a halt at Presque Isle, some 40,000 people would take home stories about what they had won, lost, ate, rode, or saw at the "fair of the future." Many will comment on the "Man who breathed fire" and wonder "How he did it." A few will wonder why he did it. Although Waller was agreeable to an interview, it was clear that he picked his words carefully in order to avoid anything that might be construed as "bad publicity." The 46-year-old sideshow owner and performer said that he had been interested in circuses as a child and began working in magic when I was 16. "I was doing magic when I was 16," said Waller. "Later after a stint in the Army and some time in college, I began working in circus magic acts, sideshows, and grind shows." Waller described a "grind show" as a show that displayed only one of two features. After more than a few years of toughing it, Waller managed to get enough acts together to form a small sideshow troupe. In 1973, he merged with another circus entrepreneur and formed the Reynolds and Waller International Circus Sideshow, of Los Angeles, Calif.
"I want this thing to be unique," declared Waller. "We have no freaks or put-ons. This is an old-fashioned, authentic circus sideshow." If there is any one thing that draws people to Waller it's probably the packaging of his show rather than the acts that incorporate it. Standing 6 meters (20 feet) high and 16 meters (150 feet) in length are a collection of circus signs (banners) that advertise the different acts in the show. An interesting feature of each sign is a circle (bullet) with the word "Alive" on it. Waller said that the reasoning behind the circles went back to the early days of sideshows and circuses when many of the attractions were a little less than authentic. "There were once so many sideshows that featured babies in bottles, mummies, and manikins," said Waller. "We feature strictly live acts." Waller said that he enjoys the entertainment business and particularly the combination of vaudeville and circus routines that working in a fair provides. "I enjoy the business," said Wellar. "I did night clubs and television, but I like the personal freedom that comes with owning your own show and working outdoors." Waller also likes money. He said that his sideshow attractions provide him with "a substantial, comfortable, living, by doing what he enjoys." While it is evident that Waller enjoys working the crowd and performing on stage, it is equally clear that there are certain hardships that he and his traveling troupe must endure. "We work eight major state fairs and 10-to-15 smaller functions in the course of a season," said Waller. "We're on the road from February until November when we take our break while on the road, we live out of trailers." Waller features several different acts comprised of individuals he has met in the entertainment field and persons he has contacted that were listed in the Guinness Book of World Records. While on the road, the work and sleep routine of fair life can wear on the nerves of the performers, but Waller said that "everyone gets along like a big family." "We have to operate as a family," said Waller. "Last night, my barker (talker) broke his leg, and as you can see, today he's back on the job - even thought he's sitting. We're in this together and despite anything, the show must go on." But the sideshow owner is not sure how much longer the show will go on. In a day when "The fair" means a conglomeration of high-powered rides, questionable games of chance' and junk food and jewelry stands, the "hurry, Hurry, step-right-up," of the barker (talker) can scarcely be heard above the noise. "I try to present some good, honest, family entertainment, flavored with a dash of showmanship," said Waller. "The sideshow is rapidly becoming a dying art form. With the rising expenses and the increasing mechanical amusements around us, I think that it will someday be impossible to take the show on the road." Until then however, Waller will continue to offer the human element of entertainment to a public whose interest may be dwindling.